Everyone know that, emerging star Arindam’s upcoming film Mu Raja Tu Rani will release in this Durga Puja. The film, being directed by Sudhansu Mohan Sahu, will have some great music by Malay Mishra. Produced by Atish Kumar Rout, the film also has an original story written by Amiyabala Rath. So, what is new in this film? To begin with, the film would see another star kid being launched in Ollywood. 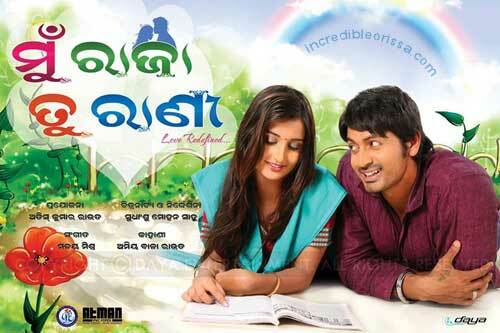 Sambhabana Mohanty, daughter of actress Snigdha Mohanty, is the lead actress opposite Arindam. “It is the love story between a cop and a criminal and will be an interesting watch,” director says. Arindam is playing ‘Biju’, who has come to the city to make some money. He accidentally meets a girl and falls for her but then situations change when he gets dragged into the crime world while his love goes ahead to become a cop. Sambhabana plays ‘Chandrika’, an orphan girl, her life changes after she meets Bijay, who helps her to make a career. And, then tables are turned when she becomes a cop and Bijay gets involved in criminal activities. How the relationship suffers and how they overcome the problems, the film is all about that. The film also has veteran actor Siddhanta Mahapatra, who is a senior cop in the film and plays an important role, bringing in the twists as he is someone who is dead against crime and criminals. Apart from him, the film has Manoj Mishra, Deb and Munna in negative shades. The others in the star cast include Hari, Akhaya and Anita Das. “This will be for the first time Odia audiences will see a love story between a gangster and a cop and I am sure they will love it,” concludes Arindam.